W erner Bierbach of Muskego, WI, entertained campers, family members, and others with cowboy and campfire songs at the Peterson Shelter, Saturday, October 18. 2008, at 7:00 P.M. Mr. Bierbach played harmonica accompanied by his Son-in-Law on accoustic guitar. The concert, lasting over 90 minutes, was enjoyed by over 50 people. Friends of Wyalusing and Park staff had baked goods and apple cider for all to enjoy. "I have been camping at Wyalusing State Park since forever," Mr. Bierbach said. "Everytime I come, I have wanted to give a concert. This time, everything fell into place. My family even came to listen!" Mr. Bierbach's family lives in Southeast Wisconsin as well as Iowa. "We have listened to our dad play harmonica all of our lives," said one of his sons. "He always has a harmonica in his pocket just like his father. During the concert, Mr. Bierbach presented a harmonica to a little girl who was celebrating her birthday. 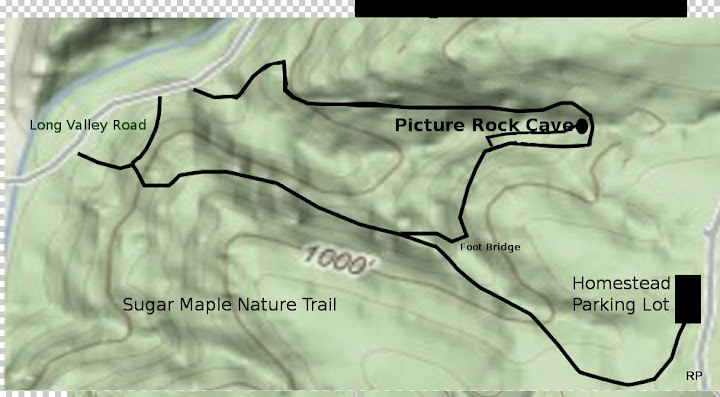 Reconstruction of Sugar Maple Nature Trail began October 14, 2000. Almost a week later, finds the two person crew continuing to scratch a new section into the hillside, bypassing the old trail between the railroad tracks and Long Valley Road. The reconstruction has progressed about 100 yards further since last week. 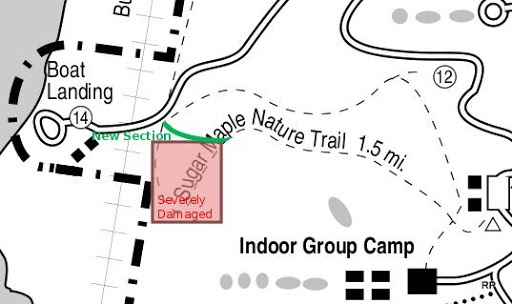 The new section of trail joins the upper portion of the existing trail. In addition, work has been done on the hillside of the new part of the trail. A small grader has been u sed to create this section of trail. Hand tools are also used when chopping trees and removing stubborn roots calls for 'personal' attention. Click on the photo link to see an annotated photo album. New Glarus Woods State Park is located 35 miles south of Madison. 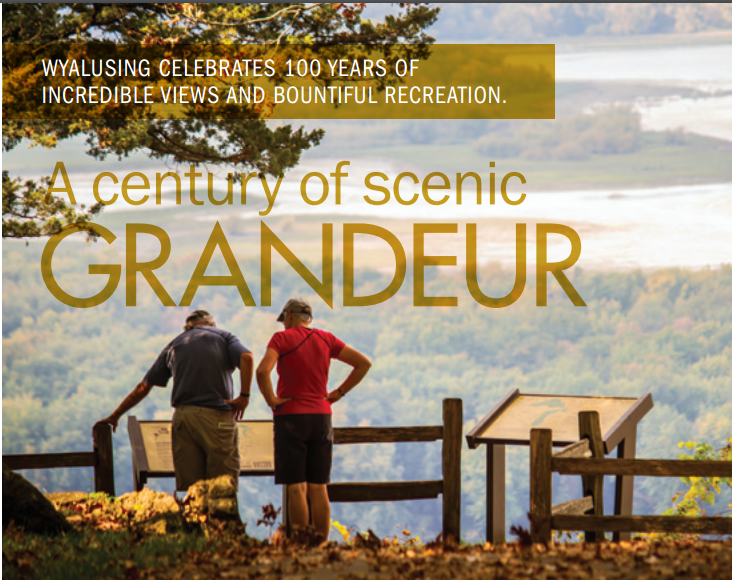 New Glarus Woods is a 411-acre state park offering camping, hiking, picnicking and snowshoeing. The park also offers direct access to The Sugar River State Trail, a 23-mile, 265-acre, State Park trail for bicycling, hiking, snowmobiling. On Thursday, September 18, 6:30 P.M-8:30 P.M., the Friends group presented 'Spirits of the Night'. During this event, groups of guests visited with the Old Timer of the Woods, Senor Turkey Vulture, Mr. Owl, a snake, Virginia Opossum, and Thee Spider. The admission fee was $1.00 per person. Park Entrance fees were waved for this event. During Spirits Night at Wyalusing State Park, one of the spirits loves to relate stories people have about the park. Sometimes stories relate events which helped to create the park, other times about legends of the park. One of the favorite story categories is about people finding 'their soul mates'. Bob and Karen re-visit the picnic area and fireplace below the Peterson Shelter, the first week in October. They have returned each year for the last 15 years. Traveling from Northern Illinois, they bring a picnic lunch. After lunch, they talk about events that happened to them during the past year. Bob proposed to Karen at this same spot, 15 years ago. Do you have a story you would be willing to share? Maybe it's about your first camping experience, or meeting a loved one. Click on the mail icon, found below, and let us know.